Japanese Busshi (Sculptors), Hakuho Period, Who Made Japan's Buddha Statues? HISTORICAL SETTING. The late Asuka period is commonly referred to as the Hakuhō (Hakuho) Period 白鳳時代, highlighted by the relocation of the capital to Naniwa 浪速 (modern Osaka) and sweeping governmental changes following the Taika Reforms (Taika-no-Kaishin 大化改新) of + 645 to 646 -- a turbulent time when the court staged a coup to regain supremacy from the usurping Soga 蘇我 clan. Ironically, the pro-Buddhist Soga clan was supported by Prince Shōtoku, but after Shōtoku’s untimely death, some say murder, the Soga had usurped the power of the throne and forced Shōtoku's heir to commit suicide, thus ending the prince’s line. The Soga were defeated in a coup led by the imperial family, after which came the Taika Reforms. These reforms abolished private ownership of land, distributed land more equally among farmers, appointed new governors in the provinces, and replaced the old tax structure with a new imperial tax system. The reforms were based largely on similar successful policies in Tang-dynasty China. The Hakuhō period was marked by lavish court spending on Buddhist temples (which increased tenfold during the period) and texts, and by the academic study of various schools of Buddhism from mainland Asia. Many monks and artisans from Korea and China made the dangerous sea voyage to Japan, and thereafter resided at important temples in the Osaka and Nara areas. Two of the most important surviving temples are Yakushiji Temple 薬師寺 and Hōryūji Temple 法隆寺, both in Nara. The former was built during the Hokuhō period, but moved and rebuilt in Nara around +710. The latter was destroyed by fire around +670 and was rebuilt soon thereafter. For more on this period, see Six Schools, Seven Temples of Nara. Yamaguchi no Ōguchiatai 山口大口費. Also known as Aya no Yamaguchi no Atai Ōguchi 漢山口直大口. A sculptor of the late Hakuhō Period who is mentioned in the Nihon Shoki 日本書紀 (one of Japan's earliest documents, released around +720 but compiled in earlier decades). The Nihon Shoki reports he was active around +650 as a sculptor of Buddhist statues. He is thought to be a descendant of a Chinese family that moved to Japan in the 3th or 4th centuries. 7th-century statue of Kōmokuten 広目天, one of the four wooden statues of the Shitennō 四天王 at Hōryūji Temple 法隆寺 in Nara. His name is inscribed on the halo of the Kōmokuten statue. 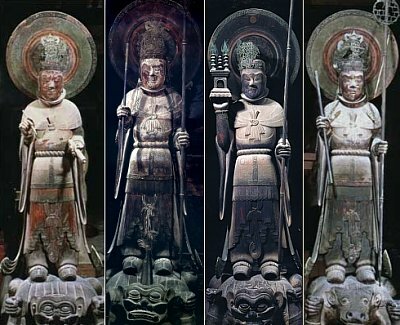 He is also thought to be the sculptor of the famous Kudara Kannon 百済観音 statue (see photo below at right), also at Hōryūji Temple in Nara, and one of Japan’s most acclaimed statues of the period. There is still some disagreement among scholars as to the sculptor who created this piece, but Hōryūji itself suggests it was Yamaguchi. Main material is bronze, which far outpaces statues made of wood. Main Characteristics: Fuller, fleshier figures, more rounded and better-balanced bodies, with softer facial features. Influences include China’s Qui, Sui & Early Tang dynasties. Quote #2. Many extant sculptures and paintings at Yakushiji Temple 薬師寺 and Hōryūji Temple 法隆寺 exemplify the Hakuhō 白鳳 style. The four wooden Shitennō 四天王 statues at Hōryūji (see photo below) are carved in the columnar style of the Northern Qui Dynasty (Jp: Hokusei 北斉 +550-577). The wooden Kudara Kannon 百済観音 (Hōryūji) shares some of the same stylistic components, although it does not project the same sense of volume as the Shitennō; its gentle curves suggest a more naturalistic treatment of the body. 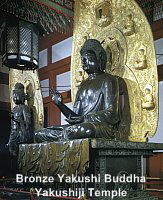 The bronze Yakushi Buddha 薬師如来 statue and its two attendant figures Nikkō 日光 and Gakkō 月光 at Yakushiji Temple are full, fleshy figures in the manner of early Tang 唐 (Jp. = Tō, To) Chinese sculpture.” <end Jaanus quote #2> See photos of Yakushi Temple pieces below. 国宝大事典 (西川 杏太郎. ISBN 4-06-187822-0. PHOTO: Same source as prior photo. Dr. Gabi Greve. See her page on Japanese Busshi. Gabi-san did most of the research and writing for the Edo Period through the Modern era. She is a regular site contributor, and maintains numerous informative web sites on topics from Haiku to Daruma. Many thanks Gabi-san !!!! Classic Buddhist Sculpture: The Tempyo Period. By author Jiro Sugiyama, translated by Samuel Crowell Morse. Published in 1982 by Kodansha International. 230 pages and 170 photos. English text devoted to Japan’s Asuka through Early Heian periods and the development of Buddhist sculpture during that time. ISBN-10: 0870115294. Buy at Amazon. The Great Age of Japanese Buddhist Sculpture, AD 600-1300. By Nishikawa Kyotaro and Emily J Sano, Kimbell Art Museum (Fort Worth) and Japan House Gallery, 1982. 50+ photos and a wonderfully written overview of each period. Includes handy section on techniques used to make the statues. 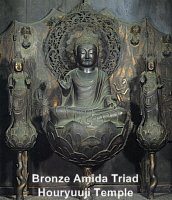 The Great Age of Japanese Buddhist Sculpture (AD 300 - 1300) . Comprehensive Dictionary of Japan's National Treasures. 国宝大事典 (西川 杏太郎). Published by Kodansha Ltd. 1985. 404 pages, hardcover, over 300 photos, mostly color, many full-page spreads. Japanese Language Only. ISBN 4-06-187822-0. Bosatsu on Clouds, Byōdō-in Temple. Catalog, May 2000. Published by Byōdō-in Temple. Produced by Askaen Inc. and Nissha Printing Co. Ltd. 56 pages, Japanese language (with small English essay). Over 50 photos, both color, B&W. Some photos at this site were scanned from this book. Of particular use when studying the life and work of Jōchō Busshi. Visions of the Pure Land: Treasures of Byōdō-in Temple. Catalog, 2000. Published by Asahi Shimbun. Artwork from Byōdō-in Temple. 228 pages, Japanese language with English index of works. Over 100 photos, color and B&W. Some photos at this site were scanned from this book. No longer in print. Of particular use when studying the life and work of Jōchō Busshi. Numerous Japanese-language temple and museum catalogs, magazines, books, and web sites. See Japanese Bibliography for extended list. Also relied on Hōryūji Temple 法隆寺 (Horyuji) catalogs and Asuka Historical Museum.